Added 6/5/10 Updated 4/2//15 Click on images for a larger view. April 28, 2015. 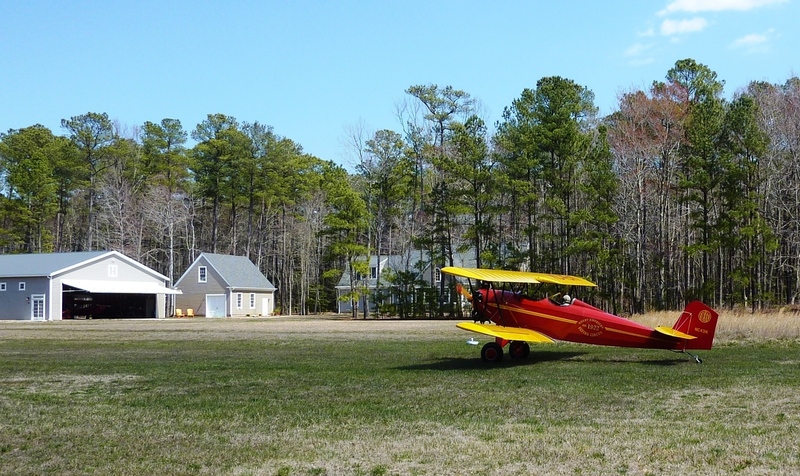 Just after I landed and was ready to put the Champ back in the hangar, we heard the sound of a Kinner radial. 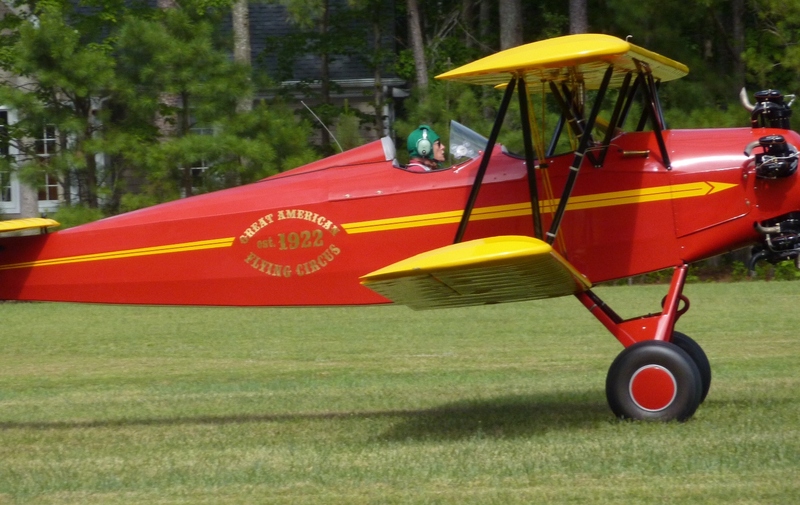 This meant Stan Sweikar was visiting from across the Potomac in his Fleet Biplane. The sound brought everyone out. Left to right: Sadie, the airport dog, Mike Roe, Stan Sweikar, John Baker. Stan's current project is a Culver Cadet. We can't wait to see that here. April 28, 2015. 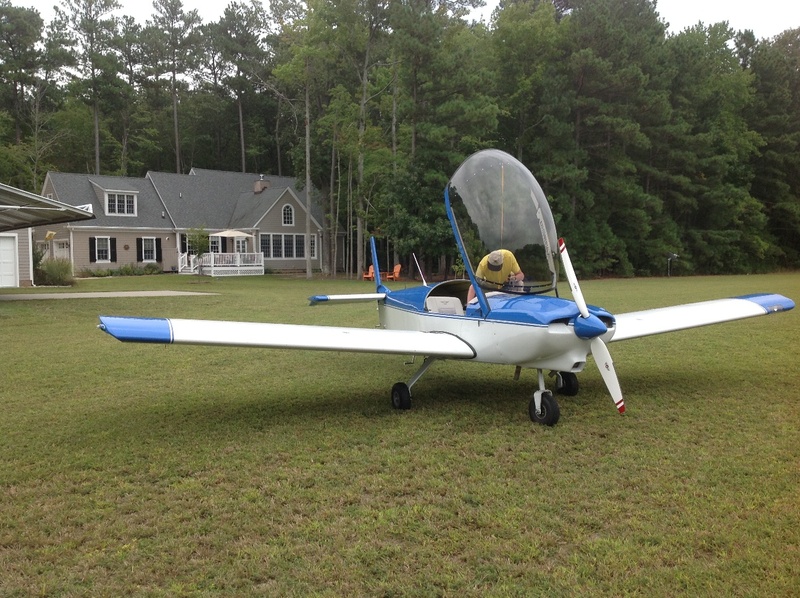 This was a perfect evening for flying, so the Champ came out of the hangar. Sukey took this photo while I was buckling in. I flew for half an hour and my logbook entry was, "Flying in Circles." My logbook indicates a high ratio of landings per hour flown - lots of short local flights, especially in recent years. November 29, 2014. My daughter Joanna snapped this photo out of the window of our Champ when she visited from New York for Thanksgiving. This is the access point to the Chesapeake Bay from the Little Wicomico River. The original, natural access point was closed by hurricane damage in 1933 and this canal was built following that. Locals call this point "The Jetties." November 16, 2014. 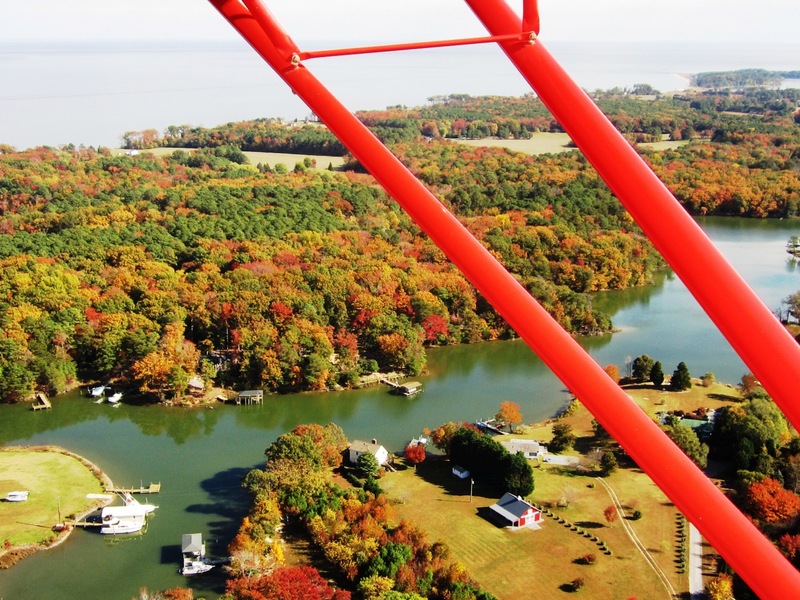 Today Sukey and I took a flight to see the fall colors and have breakfast at a nearby airport. More details and lots of photos here. September 29, 2014. We had visitors from Frederick, Maryland. Jerry Blake and Ernie O'Roark flew down for lunch. 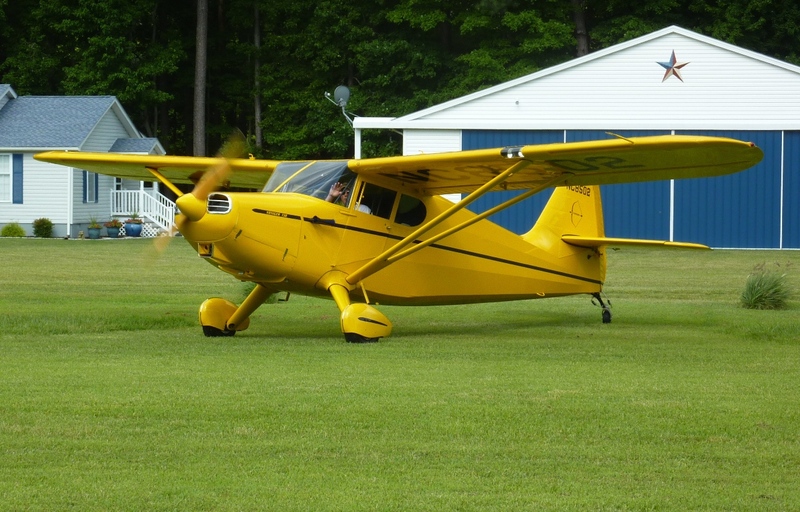 The plane is a Zenith Zodiac 601 XL powered by a Continental O-200, built and owned by the Frederick Sport Flyers, a club based at KFDK. I have known Jerry for more than 30 years. He was a founding member of EAA Chapter 524 and was director of Frederick College's Aviation Technology program. November 2, 2013. 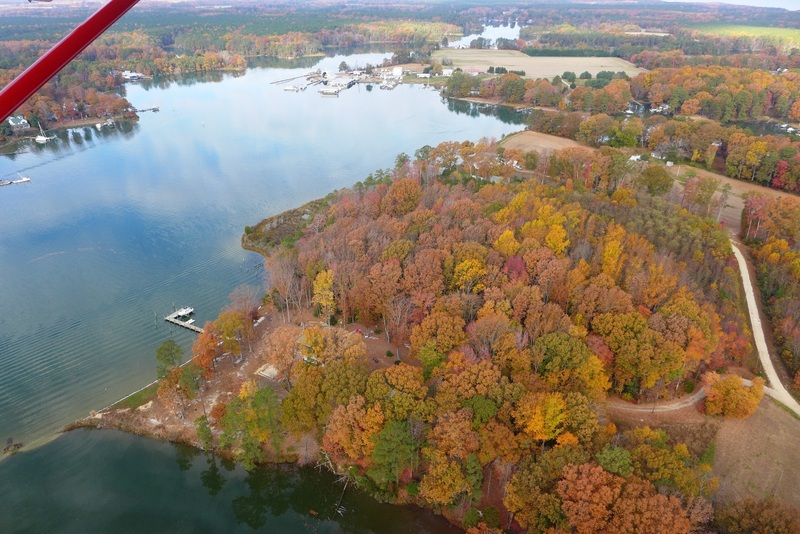 Just a few minutes south of our airstrip lies the Great Wicomico River. At Glebe Point, State Route 200 crosses the river via the Tippers Bridge. November 2, 2013. The Merry Point Ferry crosses the western end of the Corrotoman River. 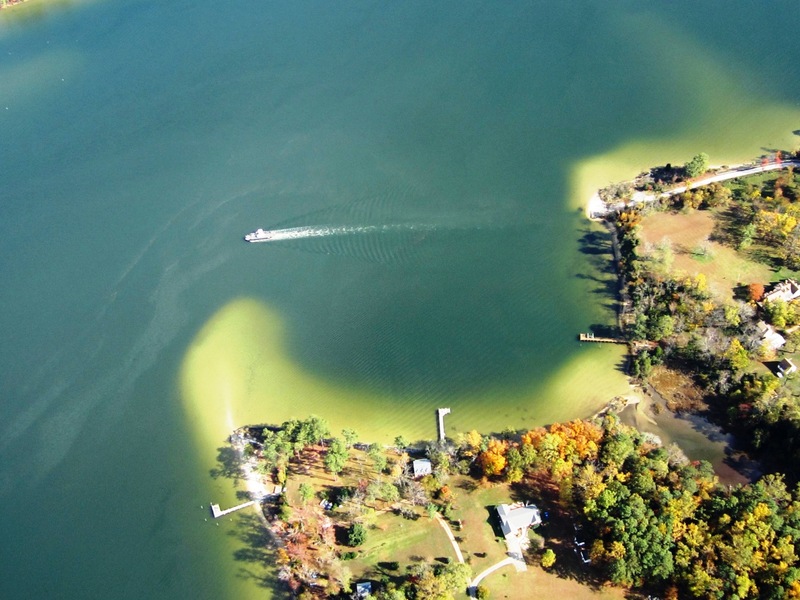 This small free ferry is operated by the Virginia Department of Transportation. Maximum capacity is two cars. Here we caught the ferry approaching mid-river. November 2, 2013. 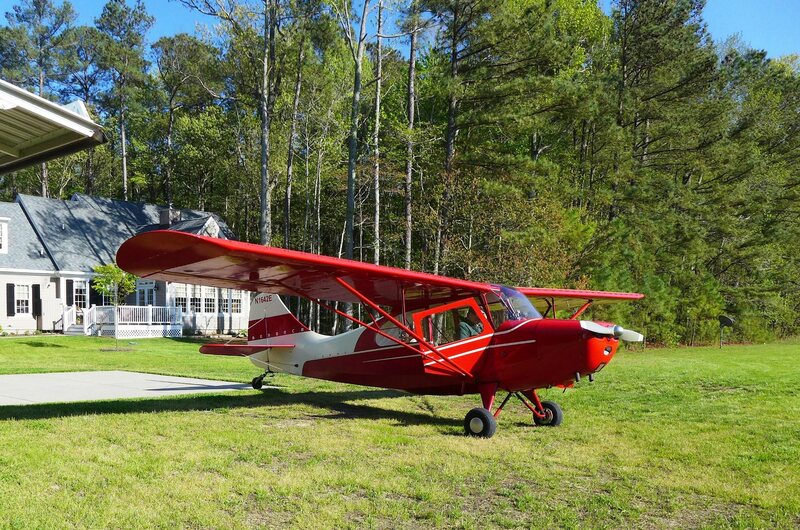 About 20 minutes south of us by Aeronca sits the small town of Urbana, Virginia. 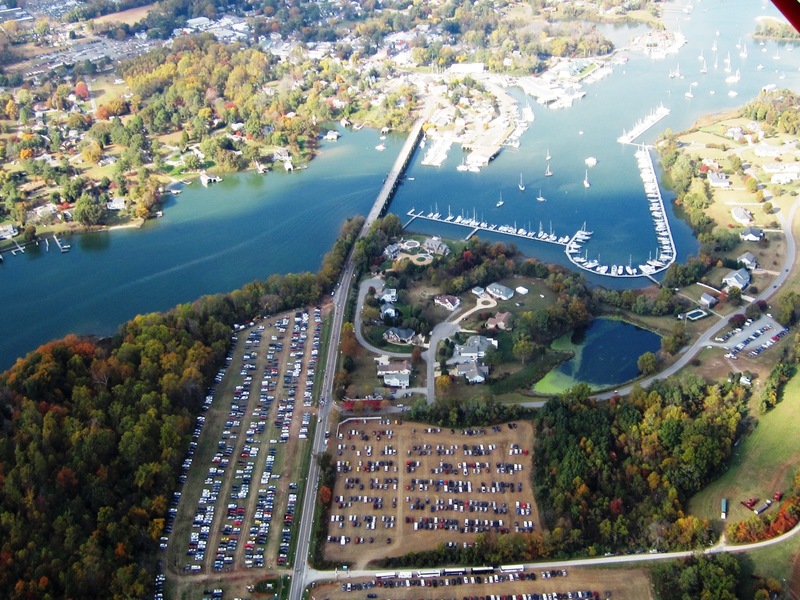 Normally Urbanna is a quiet fishing village, but each fall, Urbana hosts an Oyster Festival and things get busy. This was the 56th annual festival - quite a tradition. November 2, 2013. Today my wife Sukey and I went up to view the colors of the fall foliage. She brought her camera and snapped these photos. The colors seem to be peaking this week. October 17, 2013. This photo covers the same section of Ophelia as the previous photo, but from a different angle. I took this shot yesterday, a day where scattered and broken clouds were in the area, some as low as 1200 feet. 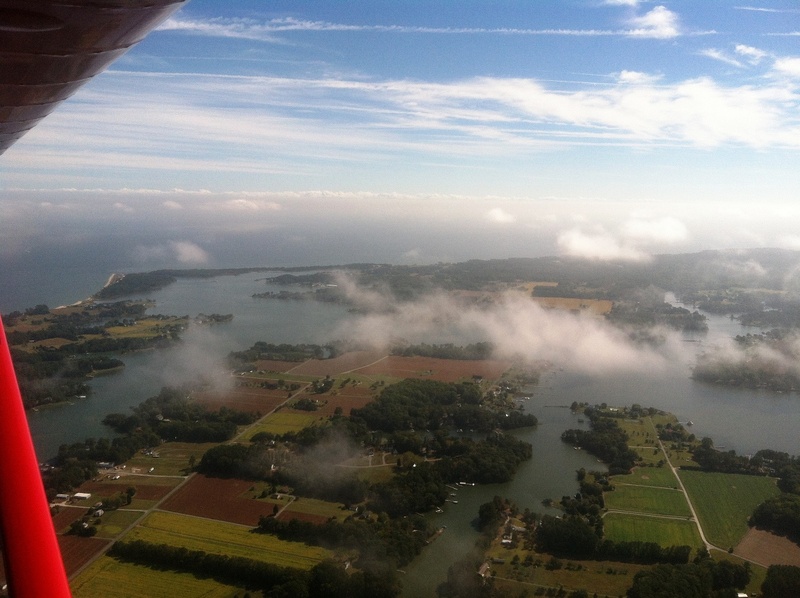 As a cautious VFR pilot, I don't often fly among the clouds, but yesterday was a good day for it. 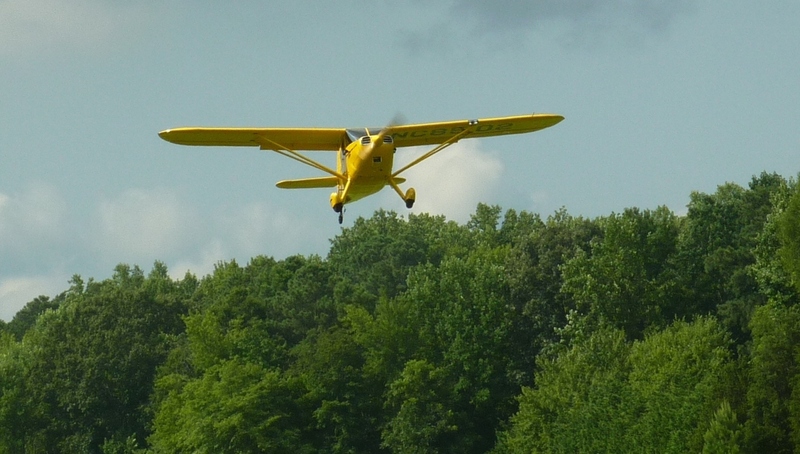 It brought to mind one of my earliest dreams of flying. I was no more than 4 years old and the dream was prompted by a cartoon I had seen of a little boy flying among the clouds in a small red airplane. The cartoon had an early Disney feel to it, but my memory of it is, as you would expect, quite vague. I do remember being in that dream, though, and it was magical. 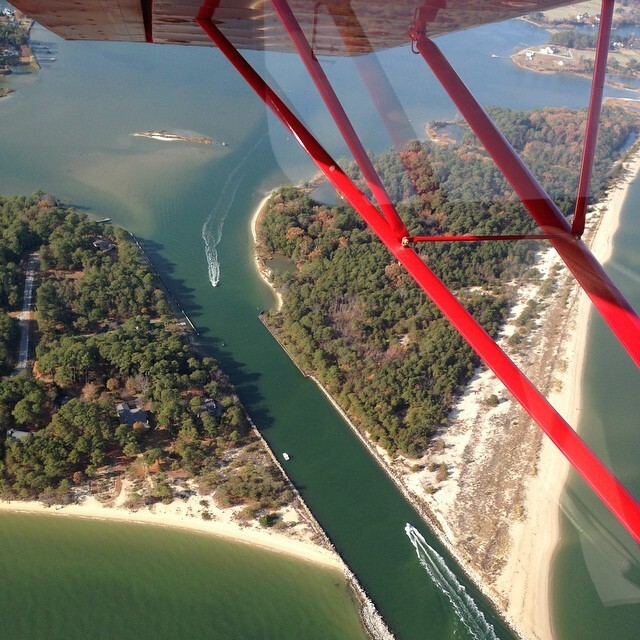 Sixty years later, in another small red airplane, the magic remains. September 17, 2013. On a crisp and clear day, I took Sukey up in the Champ for a short aerial tour over Ophelia. Visibility was unlimited, so I held the iPhone out the window and snapped this shot, flying just south of our airstrip. The view is to the east towards the Chesapeake Bay. August 26, 2013. These photos were taken when my son Andy and his girlfriend Hannah visited a few weeks ago. 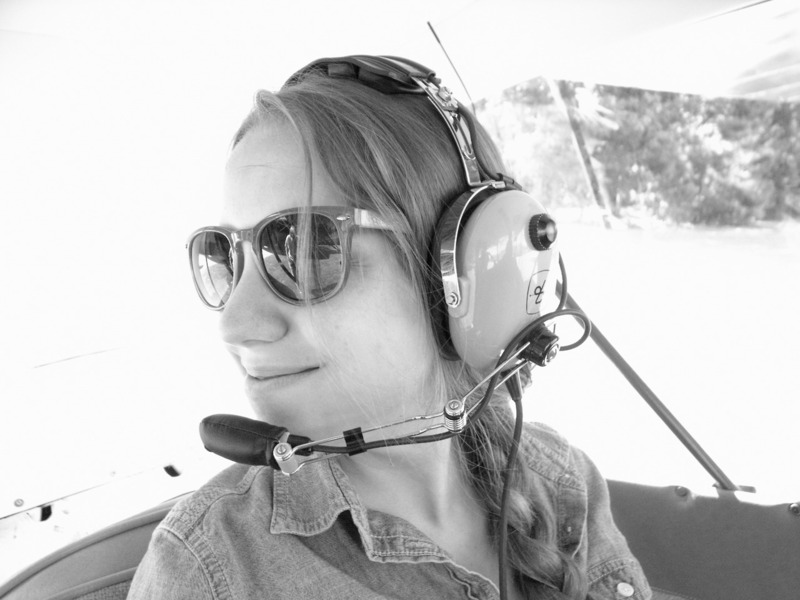 This was Hannah's first ride in the Champ and her first time to take the controls of an airplane. She did quite well for a beginner and seemed very relaxed in the plane. Photos by Andrew William Baker. July 26, 2013. Mike Roe waves as he taxis out for take-off to the north. 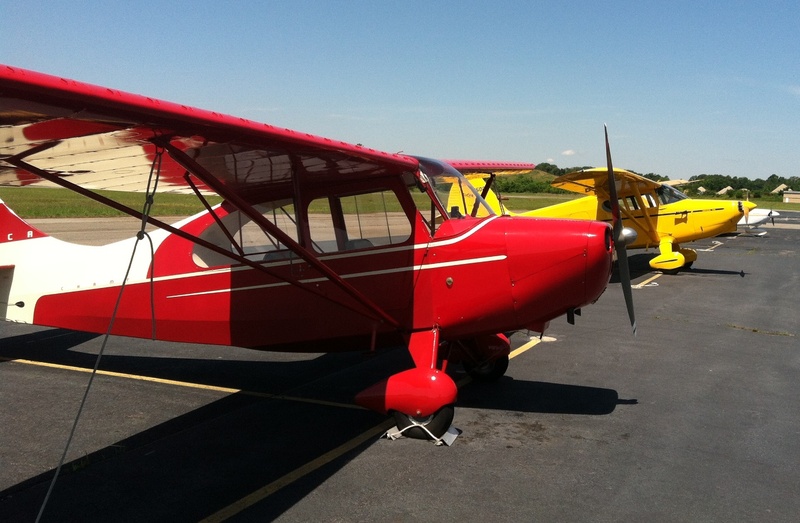 The destination is Oshkosh, Wisconsin for the AirVenture Fly-In. Mike has been invited to attend for the "Return of the Champions" event. April 4, 2013. Today I took the Champ up for a local flight. Under overcast skies, the visibility was nearly unlimited. I was anticipating the heavy rain that would be coming this evening, and wanted to get a flight in before the runway became rain-saturated again. 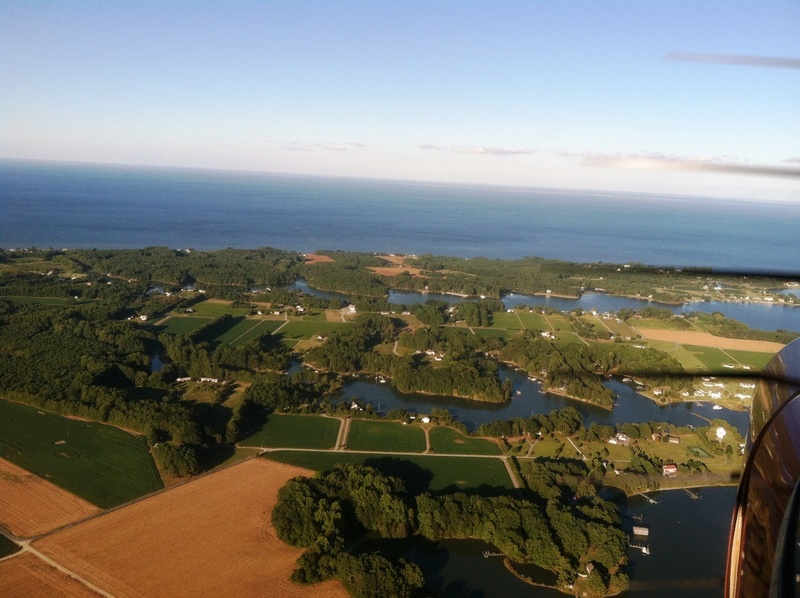 Here I am flying near the shoreline of the Chesapeake Bay at about 1500 feet, near Ingram Bay. The view out the side window is to the northwest, with Ophelia perhaps 10 miles off, on the far side of the Little Wicomico River. In the distance you can see the Potomac River and beyond that, the shoreline of Southern Maryland. To see the detail, it helps if you click on the photo to see the larger version. March 30, 2013. The Sweikar Fleet taxis out for departure for the flight across the Potomac River back to Dameron, Maryland. 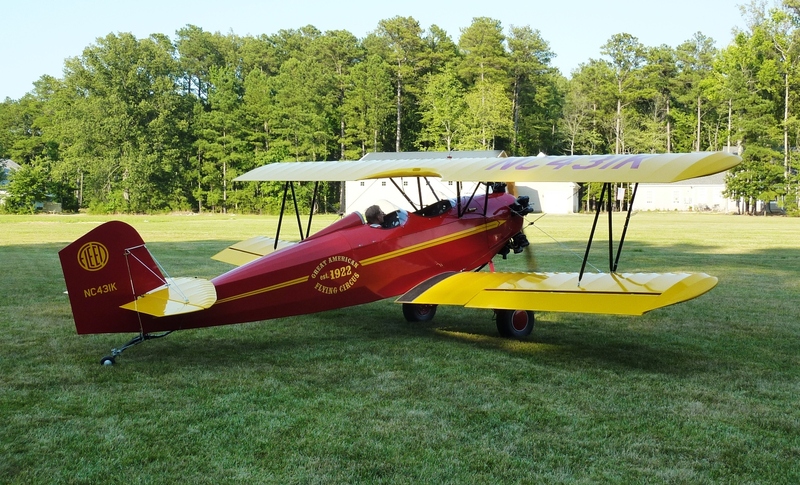 The Fleet won the Silver Age Champion award as Oshkosh and was featured on the cover of the March/April issue of Vintage Airplane magazine. March 30, 2013. Shortly after I put the Champ back in the hangar, Stan Sweikar arrived in his Fleet. March 30, 2013. After weeks of poor weather and a soggy runway, today was finally a good one for taking to the air. The runway was still soft at the south end, but the Champ did not need the entire runway. The view is of Ophelia, looking towards the northwest, with the shore of the Potomac River just visible to the right. December 12, 2012. My Chief taxis out to begin the journey to new owners in Oregon. The Cub delivered the ferry pilot, Chuck Tippett. The first stop was Petersburg, Virginia (KPTB), where it was disassembled to make the remainder of the trip in an enclosed trailer. The Chief has since arrived safely in Oregon, has been reassembled, and is being flown by the new owners. November 11, 2012. Today we pulled the Chief out of the hangar for photos with Mike Roe's Stinson 108-1. The 1931 Model A Ford belongs to VA99 resident John Haszard. Interestingly, the Aeronca and the Model A use the same fuel gauge. 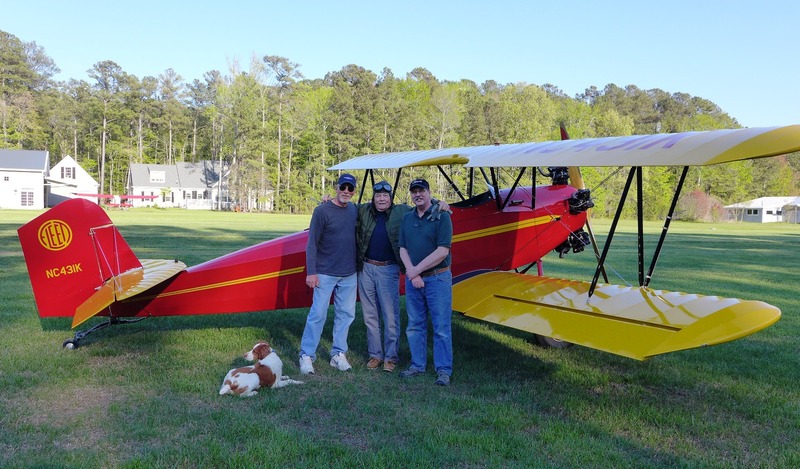 John gave me a ride in the Model A in the morning, and Mike Roe gave me a ride over Ophelia in his yellow Stinson in the afternoon. A good day! July 22, 2012. My son Andy came to visit. He's a photographer living in Rochester, New York. (He has since moved to Baltimore.) 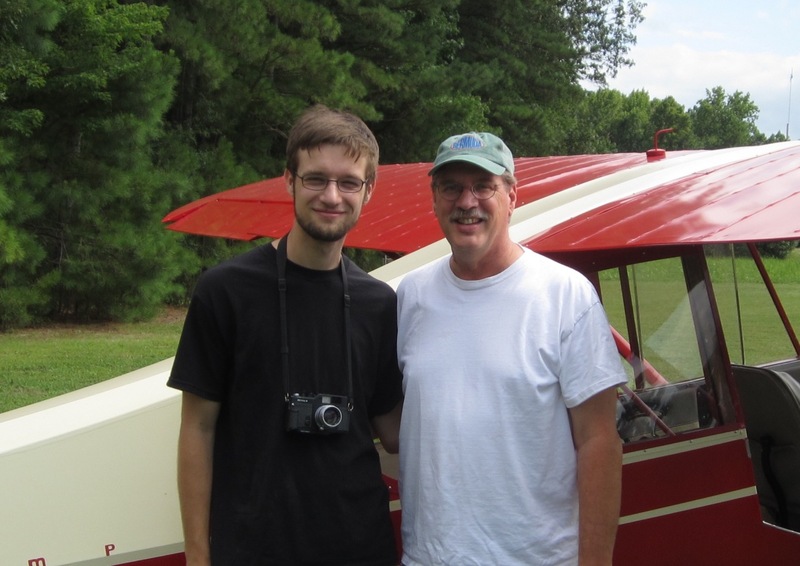 Over the years, Andy flew frequently with me in the Stinson and Chief. This was his first ride in the Champ. July 6, 2012. 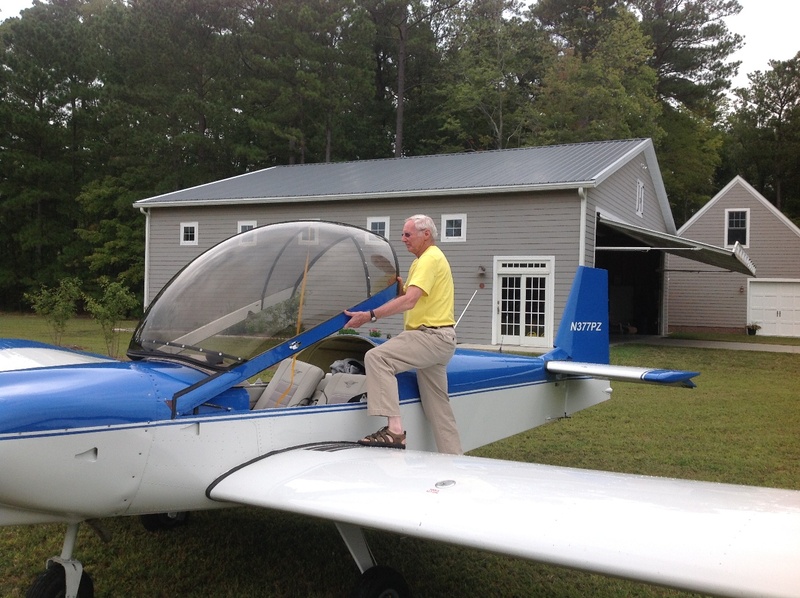 On the takeoff roll, Stan lifts the tail as he passes our house. The markings on the fuselage are as they appeared when the plane was owned by writer Richard Bach. July 6, 2012. 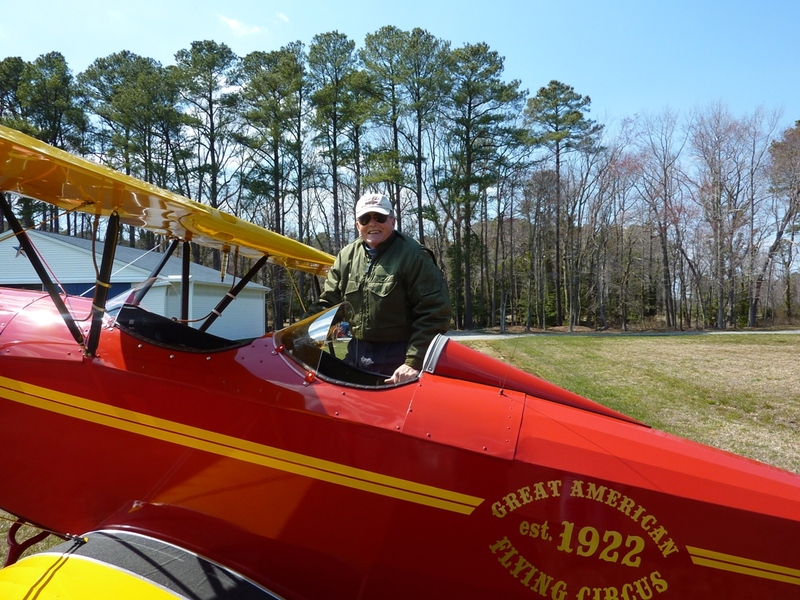 Stan Sweikar stopped by today in his freshly restored Fleet Model 2 Biplane. It's great to see this Fleet flying again after 24 years. 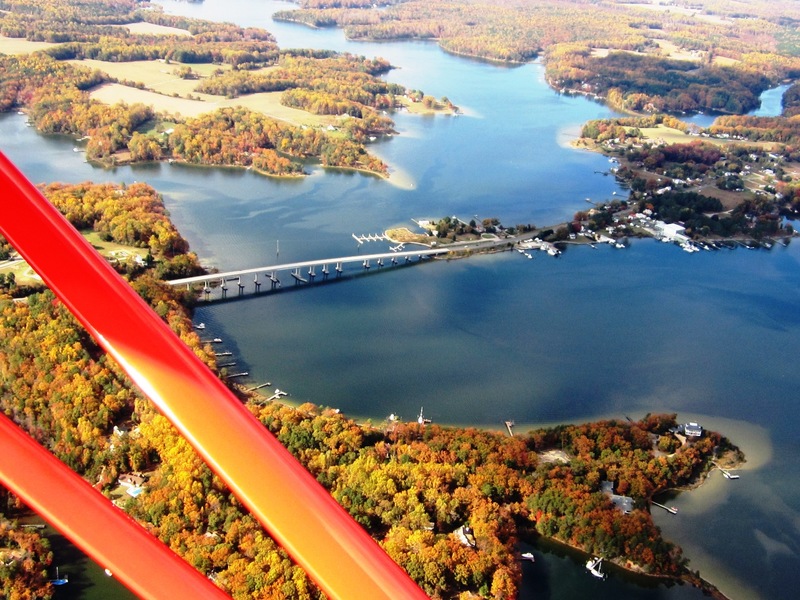 To get to Ophelia, Stan flies from his airstrip in Dameron, Maryland, which means crossing the lower Potomac River. 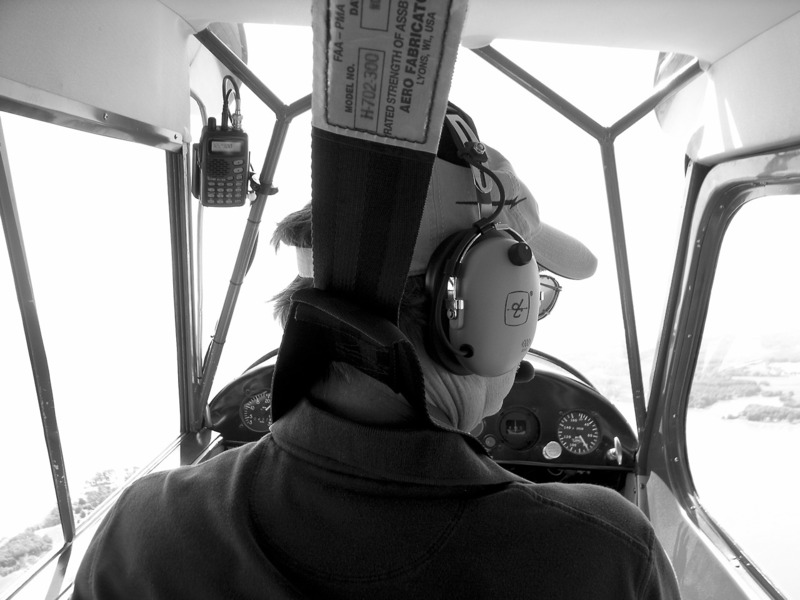 During these early flights with the rebuilt 125 HP Kinner B-5, Stan wears a life preserver for the water crossing. The flight takes about 20 minutes in the Fleet. By car the trip takes about 2.5 hours, since one must first travel north to the bridge crossing the Potomac. At the end of the month Stan flew the Fleet to Oshkosh and Blakesburg where he won awards. June 3, 2012. 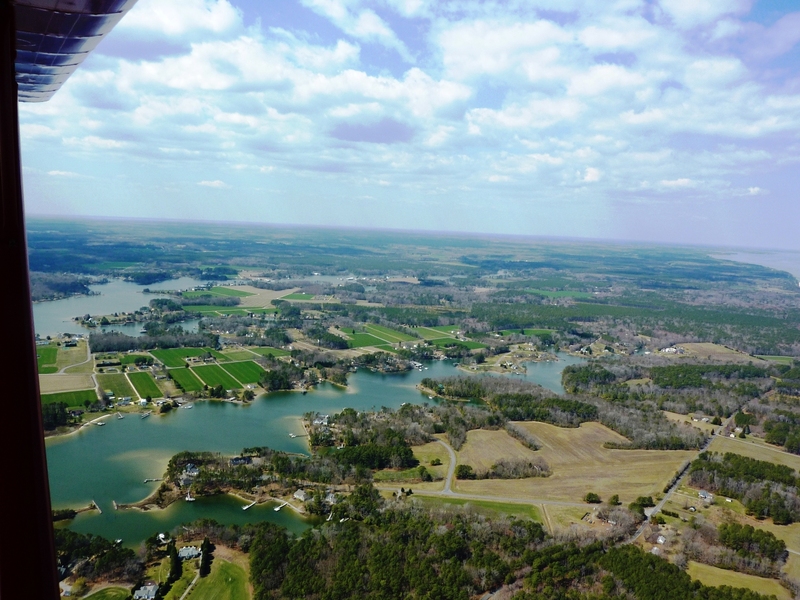 Today, we flew to Williamsburg, Virginia (KJGG) for that $100 hamburger. There is a nice cafe and you can park your plane right in front. Good food, nice atmosphere, highly recommended. 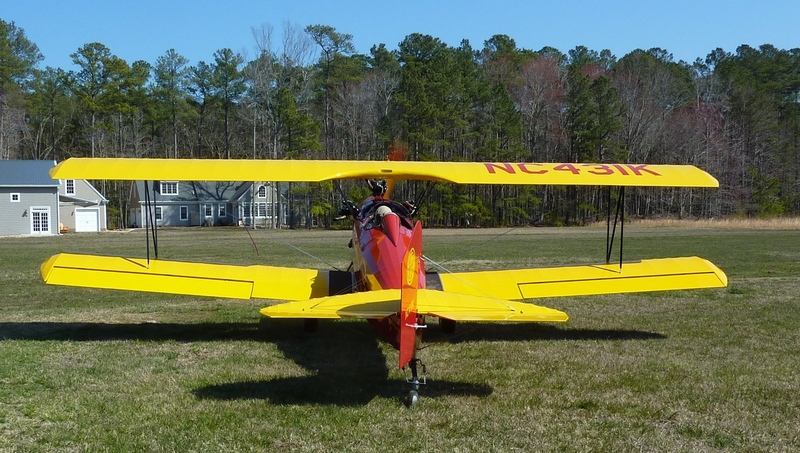 My Champ is in the foreground, behind that is Mike Roe's Stinson 108-1. Back to the main Federhart-Ophelia StolPORT page.